All these shootings take place in "gun free zones." They are all happening in supposed safe places. The shooter, a supposedly normal person, comes in and shoots innocent people and then almost always kills himself. Is there a sinister plan beneath all this? 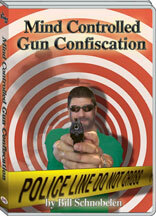 Bill is a master's level counselor and former member of the Illuminati and he examines how the elite's plan to confiscate all the firearms in the US is being perfectly served in these tragedies. He shows how many of these shooters, both teen and adult, could be "Manchurian Candidate" mind controlled assassin designed to bring about the new world order. This is an important one!